This 3-year project (2011-14) funded by the Paul Hamlyn Foundation aimed at using dialogic learning methods to enable young people to have increased ability to communicate constructively and build trust with people from different backgrounds to their own. 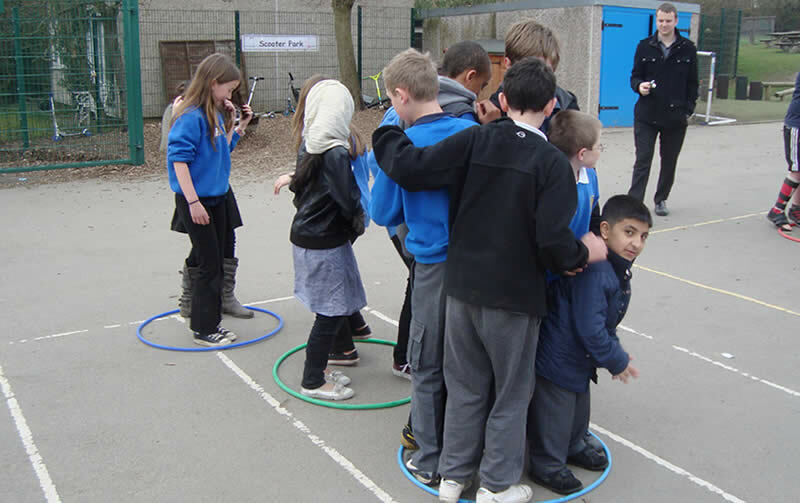 It builds on a pilot project ‘Learning From Each Other’ that was developed with funding from the ‘Prevent’ strategy. The ‘Building Communities Through Dialogue’ project focusses mainly on the transition years from primary to secondary school; it will work intensively with 420 young people (Years 5/6, 7, 10), 40 teachers and parents within 3 committed pyramids of schools in South Yorkshire from 2011 to 2014. School linking: Following the training those secondary students will help facilitate dialogue between younger students (in feeder primary schools or Y7) in structured sessions. Links will be developed between all feeder school Year 6 students through pen-pal contact and reciprocal visits using P4C. The first meeting will take place at a neutral venue following recommendations from the School Linking Network (SLN). Subsequent meetings will take place at the schools involved in the link. Tools for learning through dialogue will be used in these meetings with children and young people to enable them to reflect and engage in dialogue about issues of identity, diversity and equality. This will take place both in their class communities and with other classes during reciprocal visits. The sessions will be filmed and edited so that short clips can be disseminated via relevant websites. Transition events: Schools will be encouraged to involve pupils’ parents in parallel enquiries prior to the reciprocal visits. Pyramid transition events will take place at the receiver secondary school using P4C with feeder schools’ pupils. The learning approaches will form part of the KS3 curriculum of the pyramid secondary school. KS3 teachers will be supported through training, planning meetings, team teaching and reflection on, and evaluation of, practice and pupil progress. This is to ensure that learning approaches become embedded into the KS3 curriculum so that pupils will continue to benefit from their experiences in Y6 as they move into secondary school. Dissemination: Video film and project information will be uploaded to school and DECSY websites. The project approaches will be shared through training, at events and via electronic mailings, with the ESCAL (Every Sheffield Child Articulate and Literate) strategy, SAPERE (national P4C organisation), Schools Linking, the Consortium of DECs (Development Education Centres), Think Global (DEA), TEESNet (Teacher Education for Equity and Sustainability) with Sheffield Hallam University (SHU) tutors and students and a book chapter. Project leaders: Clive Belgeonne, Rob Unwin, Helen Griffin (DECSY). Research leaders: Robin Banerjee (University of Sussex), Rupert Brown (University of Sussex), Carol Robinson (University of Brighton). For more information contact Clive Belgeonne clive@decsy.org.uk 0114 241 2756.